Fit Affinity are a successful online business, based in Sydney. The Cut worked remotely with the client to create a high-performance custom designed Shopify theme. Shopify is all about selling, so when we work with an online retailer who wants to take an existing business to the next level, our team can always add value with new ideas and design and user experience knowledge that is results and sales focussed. When Fit Affinity first approached us at The Cut, they were already a successful ecommerce business trading high volumes in the health and fitness market. They were ready to take their ecommerce business to the next level by optimising their customer engagement, sales journeys and user experience with custom design and feature solutions. Fit Affinity specialise in supplements and sell their own brands, with special formulations for men and women to help them achieve specific fitness goals. This project was driven by the client’s excellent understanding of how people purchase their health and fitness products. Working with detailed market knowledge is great for us because our team of Shopify specialists can turn that knowledge into more effective ecommerce designs and features that improve sales conversions by increasing engagement and creating more streamlined customer experiences. For this business, as well as custom design solutions across various screens and interfaces, the ability to gather data and make useful recommendations to their clients and prospects was important. 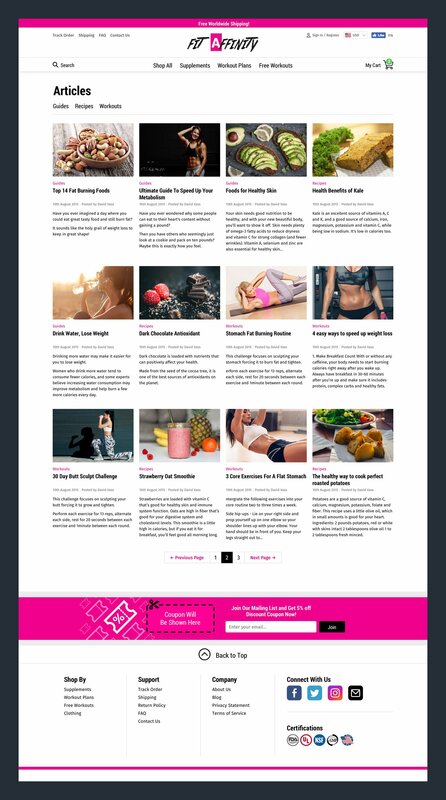 Take a look at their website and you'll find multiple touch points that encourage visitors to get more specific help and advice on the best products for their individual fitness and nutrition goals. Let's not be shy about this, ecommerce is about selling and where we can add value with our Shopify experience and Shopify Plus Partner status is by advising clients on how to not only make it faster and easier for people to reach your products, but also give them a higher value and a more enjoyable user experience as they shop online. The Fit Affinity project represented some great challenges and allowed us to explore the finer details of increasing the ecommerce sales success of a business like this one, by improving the user experience, and adding real value. With custom ecommerce features and solutions to explore, this project was in progress for a good few months as we collaborated with the client to create the highest performing final solutions. One bespoke feature we created for Fit Affinity was a Product Recommender. The recommender asks customers four simple multiple choice questions and based on the answers presents products designed to help achieve the customers desired result. The end result, a website built specifically for Fit Affinity's health and fitness product, their target markets, and business objectives. If you plan to expand your business by adding ecommerce, or improving what you already have, start a conversation with us. Our Shopify experts are here to guide you.